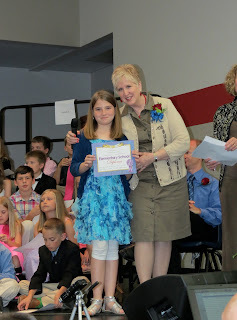 My second baby graduated from elementary school today! What a day. She didn't want me to "do" her hair (does that officially put me in the South? ), and she didn't want a bow. I know she's growing up..but it was graduation. I restrained myself, didn't complain, and didn't put a big bow on top of her beautiful head. But I can't lie to you..it was hard. ..can I add that her teacher, Mrs. Huffman, is the BEST? We have loved having her! She's been so patient and eager to learn (about diabetes). I will definitely miss her. Following graduation, fifth grade had a fun day planned..water, cookout, video games (on a big trailer..like an arcade on wheels, well exactly that! ), the firemen came to hose them down with the fire truck (can you even imagine? ), and all sorts of outdoor fun. The only thing I could think about? Not getting her PUMP wet! I warned her of the danger..then talked to the nurse, then called to leave a message on her teacher's phone (she constantly had other parents beside her), then went back to talk to her teacher..just in case. Today I cared about her pump making it to three pm, much more than the possibility of her going high. I wanted her to celebrate with the other kids, and not feel handcuffed (chained? tied? weighted by concrete blocks?) to a device. That's not how I am, or how I want her to see her life. We can keep going and playing because of the machine, it shouldn't slow her down. This is the very thing that makes teens want to quit the pump, and hide their diabetes. It becomes a burden and uncool. Ok, ok. Diabetes has never been cool. I just don't want it to be the downer at the party. So..I just told them to hang loose, and preserve the pump's life. ; ) It was fine, great blood sugars, she connected to eat, bolus, and when she wasn't water playing. We made it. Another successful day (and that made me SO much more teary and excited than graduation..is that ok to say?). In fact, today is her diaversary. Nine long years (well, they have kinda flown!) of this stupid Diabetes. We still hate it with all most of our heart. But I think I'm making room for it. Finally? 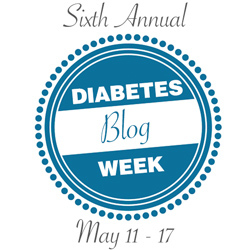 It has brought us into the sweet-hearted world of the diabetes community, both online and in our own community. I wouldn't know all these wonderful people without the big D. So...God? You know what you are doing, and I trust you. And I should thank you..even for this. A blessing in disguise.